We all love to eat peaches but I rarely buy them because I find them so difficult to cut and take the pit out. I've watched several YouTube videos and still haven't had any luck. 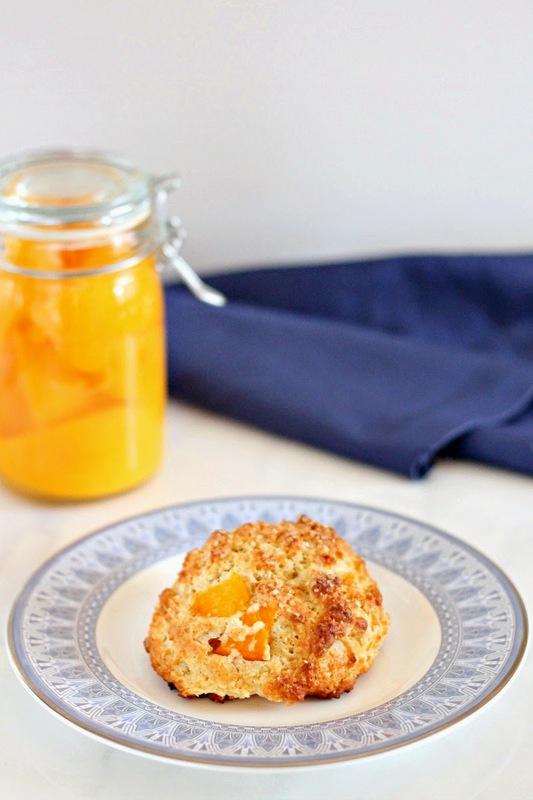 Today I'm sharing a Peach Scone recipe that uses canned California Cling Peaches. I love the convenience of having good quality peaches all year long and the best part is they are ready to use...no peeling or pitting involved! I was surprised to discover the nutritional benefits canned California Cling Peaches have over fresh peaches. They are 4 times higher in Vitamin C, 10 times higher in Folate, 1.5 times higher in Antioxidants and have a comparable amount of Vitamin E. California Cling Peaches are grown on family farms in California and are picked and packed fresh. Most canned peaches in Canada are from California. The convenience and ease of using canned California Cling Peaches is something that will make me continue to buy them. It is a great time saver since I don't have to peel and pit any peaches. The nutritional benefits canned California Cling Peaches have over fresh peaches is a real bonus. I like to avoid any additional sugar added when buying canned fruit and was happy to find the California Cling Peaches that were packed in water. The California Cling Peaches worked wonderfully in these scones. The scones are very quick to put together and are wonderful with a cup of tea! My boys loved to have them for a snack! In a large bowl, add the flour, salt, sugar, cinnamon and baking powder. Whisk together. Add the butter and mix in using a pastry blender or 2 forks until you have pieces the size of peas. In a medium bowl, add the eggs, sour cream and almond extract. Whisk together. Add to the dry ingredients and mix until just combined. Stir in the peaches. The dough will be wet and sticky. Using an ice cream scoop, drop dough onto prepared baking sheet. Sprinkle with turbinado sugar. Bake for 20 to 25 minutes, or until golden brown. Lovely looking scones.Have to try for sure. A very doable recipe with canned peaches as it is available throughout the year! I like juicy peaches and this is a nice twist on scones making them fruity and delicious. I don't know how people cut fresh peaches so perfectly. Seriously, they need to teach a class on it. These look delicious! I bet they were so good with a cup of chai :) Speaking of which, have you been on a chai bender with these crazy temperatures? I've been drinking way more than I usually do!